Western Saws or Japanese Saws for Beginners? Deciding whether to use a Western style saw or the Japanese equivalent can be a tough choice. They perform the same tasks, so what’s the difference? Now let me preface the rest of this article by saying that I am by no means an expert on Japanese tools. I own a few, and I have had the opportunity to try many different Japanese saws, chisels and hand planes. However, I do not work with them enough to consider myself worthy of giving you advice on them. If you want advice from someone who really knows his stuff, you need to visit my friend Wilbur Pan’s website. He has researched and written about using Japanese tools at least as much as I have on historical Western tools and methods – maybe even more. His web site has guides on choosing Japanese saws, setting up Japanese planes and chisels, and lots of other great information as well. With that said, before I get to answering the question about which type of saw is easier to use for a novice, let’s take a quick look at the things that these saws have in common, and what makes them different. Like I said, I’m no expert on Japanese hand saws, but I have used them enough to come to the conclusion that Japanese saws have more in common with Western style saws than they have differences. Both Japanese saws and Western saws come in two different tooth configurations – crosscut and rip. Just like Western rip saws, Japanese rip saws have a chisel like profile to the tooth. And, just like Western crosscut saws, Japanese crosscut saws have a knife like profile to the tooth. Vintage Western saws were typically taper ground so that the blade is thinner at the top than it is at the teeth. This allows the saw to have less set to the teeth and still keeps the saw from binding. Japanese saws are similarly tapered in thickness, though the profile of the taper may differ slightly depending upon the style of the saw. Finally, Western saws come in many different lengths and tooth sizes for work in different thicknesses of wood. Similarly, Japanese saws come in different lengths and tooth sizes for work in different thicknesses of wood. While these saws are very much the same in terms of function, there are a few differences worth noting. Of course the most obvious is that Western saws are designed to cut on the push stroke while Japanese saws are designed to cut on the pull stroke. This all comes down to tradition. 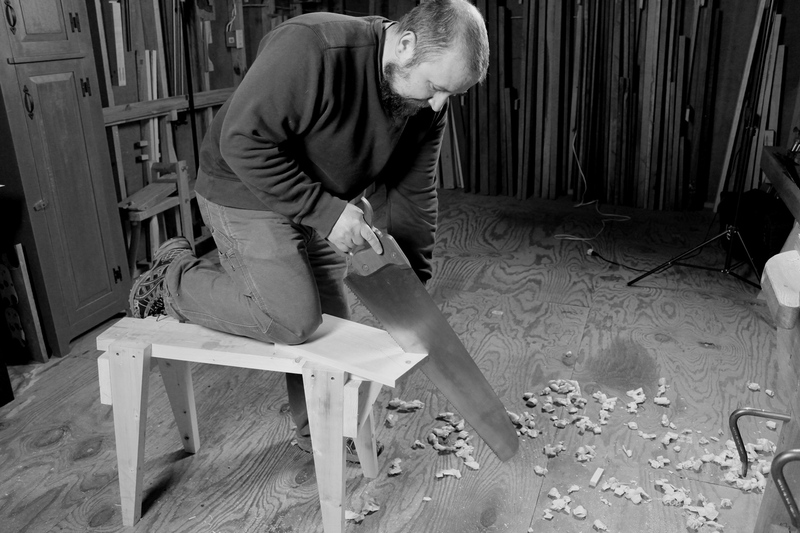 Western woodworkers have historically worked at some kind of bench between knee and waist high, making push saws easier to use (by kneeling on the work, or securing it to the bench). Japanese saws were developed for workers who traditionally sat on the ground to work. The sitting position doesn’t lend itself well to using a push stroke for planes and saws, so Japanese tools are pulled instead, which is much easier while seated. The teeth of Japanese saws are also slightly different. First, they have what is referred to as a positive rake angle – the tooth leans into the direction of the cut. This makes their cutting action much more aggressive than a Western saw, and combined with their thinner blades, allows a saw with a similar number of teeth per inch to cut faster compared to a Western saw. Western saw teeth have a negative rake angle – the tooth leans away from the direction of cut. This makes them less aggressive, so Western saws typically have fewer, larger teeth per inch compared to Japanese saws. Finally, Western saw teeth have two edges that form a 60 degree angle. Japanese saw teeth typically have a small tertiary edge at their tips that Western saws do not have. Because Japanese saw teeth are so tall and narrow, this third edge gives the tip of the tooth much more strength, and helps to prevent it from breaking off. In the photo above are my Western crosscut and rip saws and my Japanese ryoba, which has rip teeth on one side (the top in the picture) and crosscut teeth on the other side. 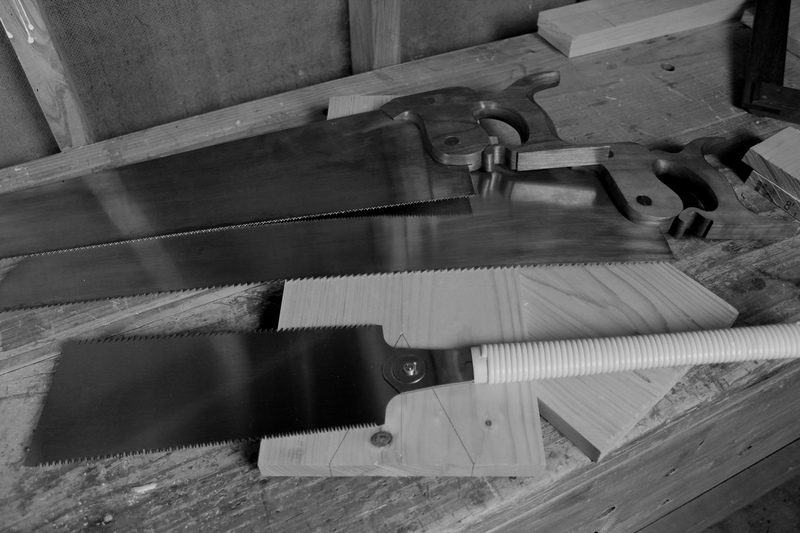 The ryoba is sized to be about the equivalent of the two Western saws. The Western rip saw has 5-1/2 points per inch and the Western crosscut saw has 10 points per inch. The ryoba has 6 teeth per inch on the rip side and 11 teeth per inch on the crosscut side. The way that these saws all cut is more or less equivalent. I notice very little difference in the cut quality between them and it is very difficult to tell by looking at the cut surface which saw made which cut. I typically use my long Western saws at a knee high saw bench. This position puts the stock and the saw in a comfortable, ergonomic position. While the cut quality of both styles of saws is more or less the same, I find the ergonomics different, and therefore, I tend to use these saws differently. When I use my Western rip and crosscut saws, I usually work at a knee high saw bench. This positions the stock at a comfortable height for using a long push saw. When using this saw, I typically position the cut line on my right side and align the cut line, my sawing arm, and my right eye all up in a single plane. The sawing motion is a straight line along side my body. I have found that this is the most comfortable position for me to use my long saws and my cuts are straight and plumb when I use my Western saws in this way. However, when I tried to use my ryoba this way, I had problems. I wasn’t able to saw straight and plumb when I aligned myself up the same way as I do with my long Western saws. No matter how much I focused, the saw always tended to drift on me, and I had a hard time keeping it plumb. It wasn’t until I watched Toshio Odate use one of these saws that I was able to get better results with mine. When I switched to using my ryoba with two hands and sawing directly in front of me, my results with the saw improved dramatically. After watching Toshio use a ryoba to crosscut and rip a board, I tried a different stance. Toshio used the saw by simply propping the board he was sawing up on what appeared to be a 6 x 6 laying on the floor. He stood on the board with one foot and used the ryoba with two hands directly in front of him. I mimicked this sawing position, however, I secured my board at the bench rather than on the floor. The result was instant improvement, and I have been using this saw with this two handed grip and sawing right in front of me ever since. Now as I said earlier, I am far from an expert on using Japanese saws, but I was able to find a sawing technique that allowed me to use my ryoba to saw just as accurately as I can with my Western saws. But it did take some practice and experimentation. So getting back to the question above, which saw do I think is easier to learn for a novice? I think either one. It’s really just a matter of what you get used to. There’s no “better” choice for a novice as far as learning to use the saw goes. There are great saws in both styles and there are junk saws in both styles. Regardless, both types of saw require proper form and practice to make straight, precise cuts. The ergonomics of the two styles do differ though, so take that into account when you are trying them out. I really recommend you try both styles and choose whatever style is more comfortable for you to use, and the one that speaks to you. 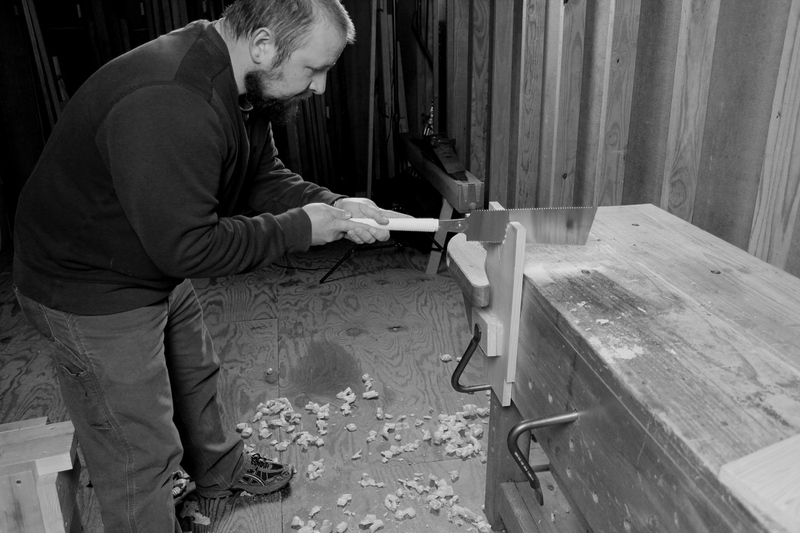 When it comes to using hand saws, comfort is the most important thing to consider. If a saw fits you well, and is sharpened well, it becomes an extension of you and it is much easier to learn proper form. If the saw isn’t comfortable for you, you’ll fight it and have a hard time sawing accurately, regardless of the style. In the end, you’ll know which one you prefer. But you don’t have to choose one or the other. There’s no reason we can’t use both. Posted in Hand Saws, Tools and tagged beginner, crosscut saw, japanese saw, rip saw, ryoba. ← What is Sawing to the Line? Thanks for the great article on the saws. I have been looking to purchase a Japanese hand saw. You give some great advice. Thanks Scott! Definitely check out Wilbur’s site before you buy. He will be sure to get you started right based upon what you want the saw for. He’s written a lot about Japanese tools, saws especially.